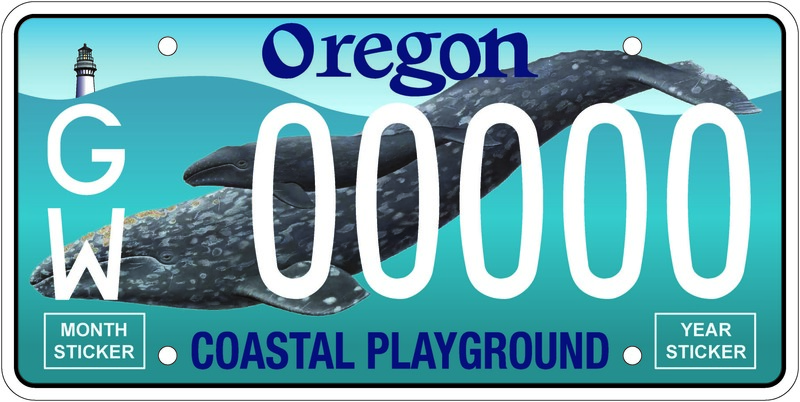 NEWPORT, Ore. – A new Oregon license plate, with the image of a gray whale mother and her calf, will be available at Oregon Department of Motor Vehicles offices throughout the state beginning on Feb. 1. The plate will cost $40 to order or renew – $35 of that total will go to the OSU’s Marine Mammal Institute for marine mammal research, graduate education, and public outreach. People who have previously purchased vouchers for the plates may submit those at DMV offices in lieu of this fee. 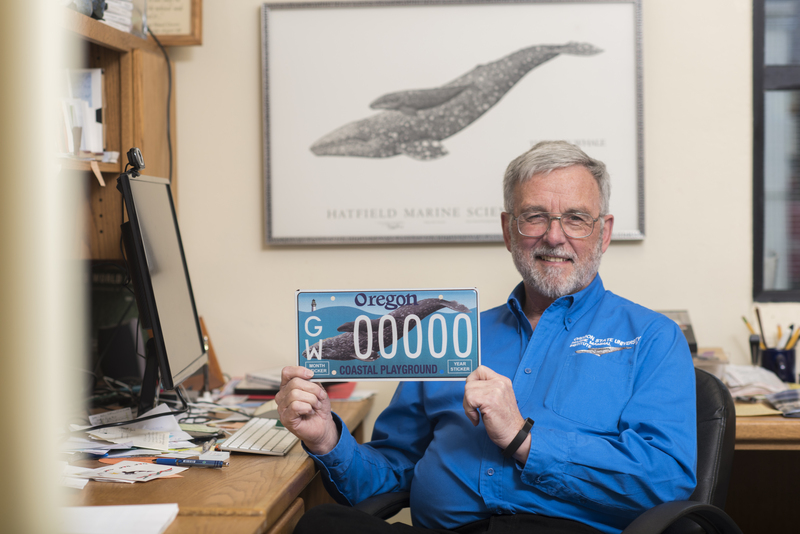 Those transferring new whale plates to an existing Oregon-registered vehicle will have some small additional fees to transfer new month and year stickers to the new plates. More details about the license plate can be found here: http://bit.ly/2B2LeSz. DMV has ordered 10,000 of the specialized plates. 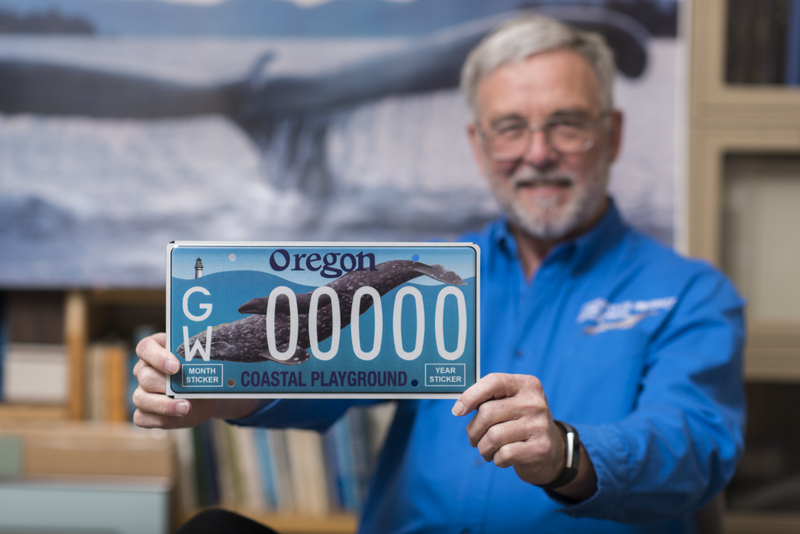 The first 20 numbered plates will go to the people who support the coast, including Oregon’s coastal caucus of state senators, representatives, the governor and OSU President Ed Ray, who each paid for their own vehicles’ plate changes. The whale license plate legislative effort was led by Rep. David Gomberg of District 10 on the central coast, who championed the idea for several legislative sessions. The program will support public outreach efforts, including the notable “Whale Watch Spoken Here,” where OSU researchers annually train more than 100 new volunteers to staff coastal viewpoints on 22 headlands along the Oregon coast every Christmas vacation and spring break. These volunteers provide information on migrating whales and conservation issues to Oregon Coast visitors and residents. Oregon State Parks manages the program that annually reaches up to 45,000 visitors from 50 different countries. Mate is an internationally recognized expert in marine mammal research. He pioneered some of the earliest research into tracking whale behaviors by satellite. The Marine Mammal Institute continues to figure out the migration patterns and seasonal habitats of endangered whales throughout the world. The Marine Mammal Institute was established in 2006 at OSU’s Hatfield Marine Science Center in Newport, Oregon, as an expansion of research programs founded by Mate in the 1970s at OSU. Internationally renowned wildlife illustrator Pieter Folkens drew the whale mother and calf gray whales that appear on the new license plates. Emmy-award winning graphic artist Pete McKeeman added a two-toned background representing the sea and sky and highlighted by a coastal lighthouse in the upper left corner. The bottom inscription reads “Coastal Playground,” reflecting the importance of the coast to marine animals and to coastal tourism. About OSU's Hatfield Marine Science Center: The center is a research and teaching facility located in Newport, Ore., on the Yaquina Bay estuary, about one mile from the open waters of the Pacific Ocean. It plays an integral role in programs of marine and estuarine research and instruction, as a laboratory serving resident scientists, as a base for far-ranging oceanographic studies and as a classroom for students.